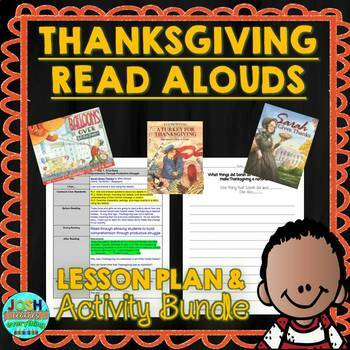 ✏ This is a guided reading or interactive read aloud lesson plan bundle for 3 Thanksgiving mentor text picture books A Turkey For Thanksgiving by Eve Bunting, Balloons Over Broadway by Melissa Sweet and Sarah Gives Thanks: How Thanksgiving Became a National Holiday by Mike Allegra. The plans include teacher scripts with strategic stopping points and questions for students. 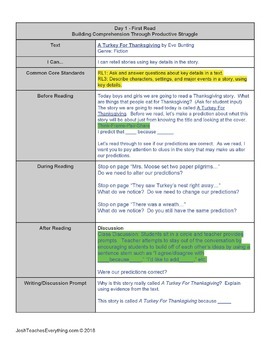 They also includes prompts for student responses through discussion or in writing or reading response logs. The printable prompts and activities designed to be glued into a notebook or as stand-alone activity papers. 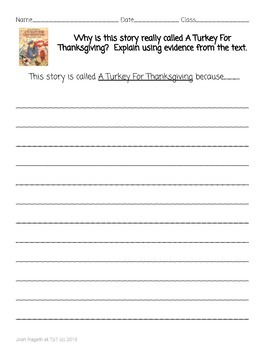 The lessons are focused on a theme of key details, character description, author's message/lesson, and comparing and contrasting but can easily be modified for other uses. 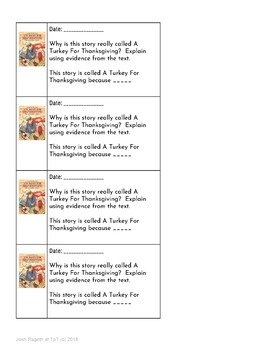 These are great read alouds for Thanksgiving to teach the origin of the holiday and the Macy's Thanksgiving Day Parade.